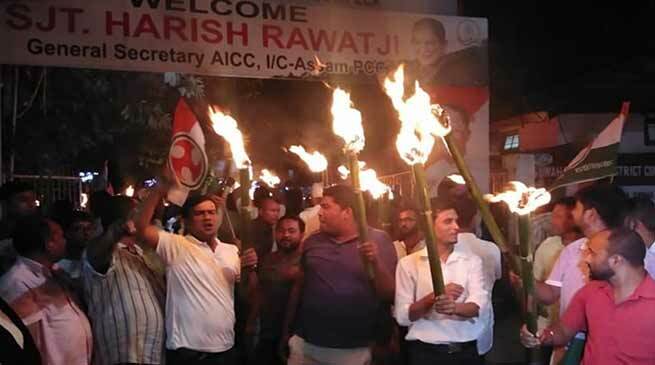 Assam Pradesh Congress Committee on Sunday evening took out a torch protest rally in Guwahati against rising fuel prices. Assam Pradesh Congress Committee on Sunday evening took out a torch protest rally in Guwahati against fuel price hike and in support of Monday’s Bharat Bandh called by the party. Former Chief Minister of Uttarakhand and senior Congress leader Harish Rawat, Assam Pradesh Congress Committee (APCC) president and Rajya Sabha MP Ripun Bora and hundreds activists of the party took part in the protest rally. The Congress workers raised slogans against Modi government for failure to control fuel price and essential commodities. Talking to NortheastIndia24 , the Congress workers has said that ” Bharat bandh on September 10 as a mark of strongest sign of protest against Arbitrarily price of fuel prices and other subsidiary product which intern will push the price rise of other commodities in state and region and will have consequential effect on the economic condition and to general public”. They also said that ” the Indian currency is going down, purchasing power of Indian money is devaluating which have never seen. The price of the crude oil have also gone down but instead of bringing the price down of fuels including cooking gas but it is increasing to manyfold”.